Have You Adopted Messaging in Your Business Processes? It has become more evident than ever: any business that wants to be successful needs to have the proper means of communication established. For many years, this meant utilizing email for business correspondence. Now, while email still has a valuable place in business operations, users rely on messaging platforms that almost ensure that they get their point across instantly. Increased collaboration - With an instant messaging platform at their disposal, businesses of all sizes have seen their operations increase in speed, efficiency, and convenience. This is a direct result of the ability users have to instantly communicate with one another. Improved team building - It’s one thing to give your team the ability to exchange information more quickly, and entirely another to have a team grow familiar and comfortable while working with each other. A messaging solution can allow a team to get to know one another through the casual conversations that they will ultimately have when not discussing business information. Intuitive platform - Instant messaging does more than allow users to communicate more efficiently, it also allows them to refer back to those messages to pick back up in the workflow. Keeping a team member up to speed is a lot easier when they have access to the information that was shared, thereby allowing them to pick up where things left off. However, as beneficial as this solution has the potential to be, instant messages also have the potential to be just as distracting and counter-productive as they are useful. Fortunately, there are a few ways to reduce these negative effects with a few guidelines. 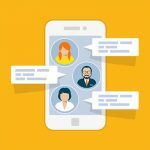 Reinforce the rules - When it comes to the potential distractions that your company’s instant messaging solution could present, you want to be proactive in laying down the law. Make sure you establish, communicate, and enforce any acceptable use restrictions that you see fit to avoid the “You never told us that…” conversation with your employees. Of course, you will also have to lead by example and abide by these rules yourself. Remind your staff of how fast “instant” is - The speed of instant messaging is one of its greatest benefits, but if that speed isn’t taken into account, it could lead to miscommunications down the line. In fact, there are plenty of messages that aren’t well-suited to the quick and dirty communication style that instant messages encourage. Restrict casual messages - Let’s be realistic for a moment: your staff is going to use your instant messaging solution to carry on non-work-related conversations. That’s just going to happen. While this is more or less harmless when it is done in moderation, make sure you gently remind your employees that their instant message application should be used primarily as a tool to help them get work done, and even then, not all messages are well-suited to the instant format. No matter how you slice it, adopting an instant messaging platform will require you to better communicate with your staff. Compudata can assist you in implementing such a solution, as well as many others to promote business productivity. Reach out to us at 1-855-405-8889 to learn more. Comments Off on Have You Adopted Messaging in Your Business Processes? Compudata strives to provide the best comprehensive IT, Computer, and Networking services to small businesses. We can handle all of your organization's technology challenges, starting with planning, implementing, and supporting the IT solutions that are critical to your growth and success. Copyright Compudata. All Rights Reserved. "Defining What IT Can Be Since 1995."